Your marine advertising works harder... covers your entire market... to produce more sales for you... in the leading magazine, MARITIME REPORTER. REQUESTED BY THOUSANDS MORE BUYERS WORLDWIDE - MARITIME REPORTER is requested, in writing, by thousands more marine men who specify and buy than any other marine magazine in the entire world. REQUESTED BY THOUSANDS MORE U.S. BUYERS-Throughout the entire United States... MARITIME REPORTER is requested by thousands more shoreside buyers than any other U.S. marine magazine. REQUESTED BY THOUSANDS MORE FOREIGN BUYERS-Than the second magazine, ME/Log. 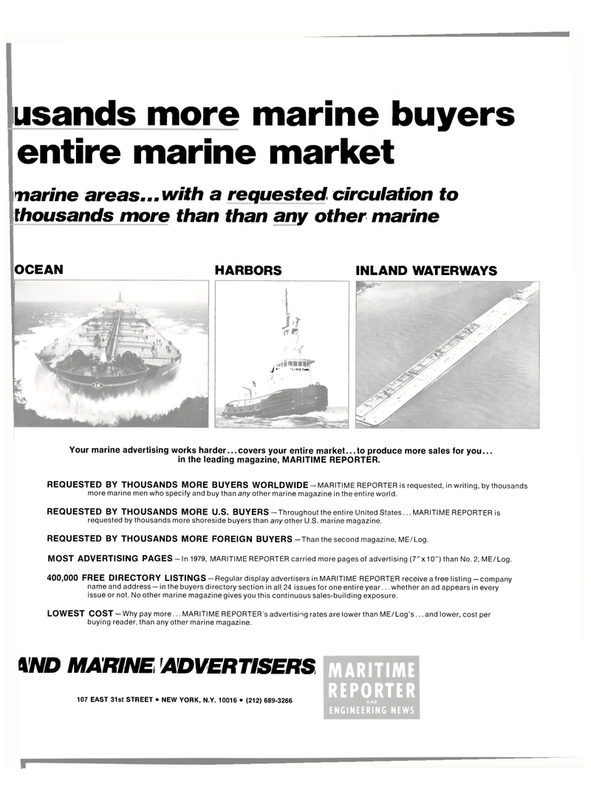 MOST ADVERTISING PAGES-In 1979, MARITIME REPORTER carried more pages of advertising (7" x 10") than No. 2, ME/Log. 400,000 FREE DIRECTORY LISTINGS-Regulardisplay advertisers in MARITIME REPORTER receiveafree listing-company name and address —in the buyers directory section in all 24 issues for one entire year... whether an ad appears in every issue or not. No other marine magazine gives you this continuous sales-building exposure.